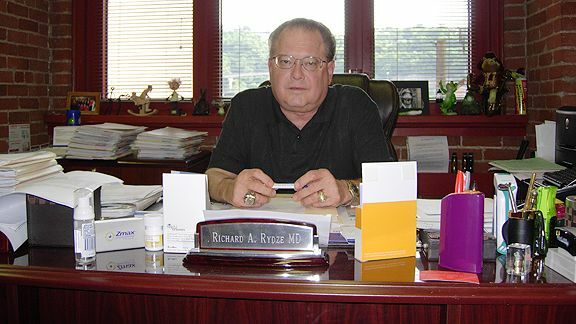 Dr. Richard Rydze, a former doctor for the Pittsburgh Steelers professional football team, was indicted on 185 counts involving the illegal distribution of anabolic steroids, human growth hormone and oxycodone in addition to healthcare fraud and obstruction of justice. Rydze was a member of the Steeler medical staff until his resignation in 2007. He was forced to step down after it was revealed that he had purchased $150,000 worth of human growth hormone (hGH) and anabolic steroids from the Signature Compounding Pharmacy in Florida. His name was leaked to the press along with the names of dozens of athletes and entertainers during the course of an investigation into Signature by the Albany County District Attorney’s Office in New York. Rydze was a big believer in the use of hGH for the treatment of tendon and ligament injuries. In fact, he admitted to ESPN in January 2009 that he had conducted his own personal research project involving the effect of hGH on soft tissue injuries. The research project showed positive results in 200 of his patients over the course of five years. Rydze denied that any of the patients administered hGH were members of the Pittsburgh Steeler or any other professional sports organization. Rydze admitted to ESPN that he was not aware that the prescribing of hGH for off-label use was illegal. Since then, the Federal Bureau of Investigations (FBI) has concluded a long-term, extensive investigation into his medical practices. The indictment alleged that Rydze’s violations of the law began as early as 2005 and extended well into 2012. Three other individuals were linked to Rydze. Two of them were identified as part of the Rydze conspiracy – William Zipf and James Hatzimbes. Rydze allegedly conspired with Zipf to distribute oxycodone, oxymorphone, oxycontin and opana. Rydze also allegedly conspired with Hatzimbes to conduct “steroid clinics” during which they would recruit customers for their hormone replacement and longevity practices. Rydze operated the Optimal Health Center LLC (OHC) while Hatzimbes operated the HSE Salon and Wellness Center. Prospective patients paid $75 to attend each “steroid clinic”. Rydze allegedly offered a variety of anabolic steroids including stanozolol (aka Winstrol), nandrolone decanoate (aka Deca Durabolin or Deca), testosterone enanthate, testosterone cypionate and oxandrolone (aka Anavar). Rydze reportedly provided prescriptions and directed his patients to purchase anabolic steroids from a compounding pharmacy identified as ANEWrx. ANEWrx was owned by William Sadowski. Sadowski was indicted as part of a separate criminal investigation. Rydze was paid $301,407 in commissions for referring patients to ANEWrx between August 2007 and January 2011. The case is being prosecuted by Assistant United States Attorneys Carol M. Skutnik and Matthew B. Kall for the Northern District of Ohio. The investigation was supervised by Stephen D. Anthony, Special Agent in Charge of the FBI’s Cleveland office.